Adsense supports paying earnings to publishers through various methods such as checks, electronic funds transfer (EFT) and wire transfer. Adsense also supports sending payments through Western Union Quick Cash which is a quicker and less complicated compared to the other methods. Payment through Western Union is however only available for some select countries. To receive a payment through Western Union one only needs the Western Union MTCN Number. This number is included in the adsense receipt and includes other details of your payment such as the recipient's name, the amount, the sender's address (i.e Google Ireland) and the Billing ID. When withdrawing, one is also required to prove their identity in addition to providing the MTCN number. This is typically done by providing one's national identification card so that the western union gent confirms the names match with the payee names provided by the sender. One may also be asked to provided an answer to the secret question in which case you provide the Billing ID. Some agent's will however just ask straight for the billing ID. Now everything may checkout but with Adsense payments it's likely that you'll run into a problem with the agent regarding your names. This happened to me on two occasions, luckily in both I only got a warning to instruct the sender to update my names. The exact problem is that the agent may decline to release the funds because the payee name from Google doesn't have the three names as displayed in your identification. This might seem incorrect at first since the three names that you signed up with for the Adsense account will be displayed on the payment receipt along with your address. Thing is the agent doesn't see these names. Instead they see the recipient names that are provided in the Western Union payment options in Adsense Payment settings. This recipient name is INDEPENDENT of that in your account and you can actually use different names for it should you want to. 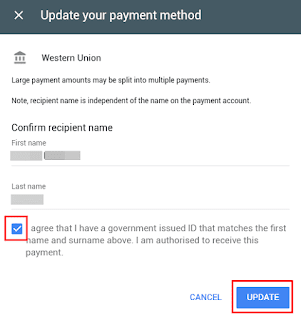 Google has to blame for this problem since there are only two fields for the recipient name in the Western Union payment settings i.e First Name and Last Name. So naturally most people just comply by entering their two names: their first name followed by either their surname or middle name in the last name field. 2. This will launch Update your payment method pop up window that has your current two names. 5. Agree to the terms and click update to apply the new names. What if the Agent declines to release the payment? If the agent refuses to pay you because of this little confusion, you can wait for 60 days and the money for this payment will be refunded back into your Adsense account. 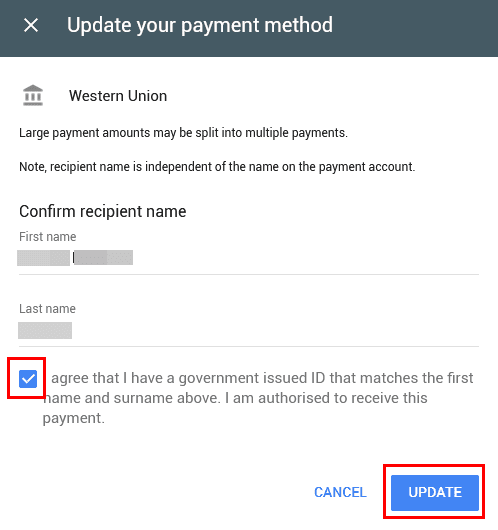 By the time this happens, update your name as explained above and in the next payment cycle your accumulated money should be sent with the updated three names.